When was the last time you walked outside and inspected your fence? When was the last time you walked outside and inspected your fence? No matter if it’s made of wood, vinyl, aluminum, or chain-link, unpredictable spring weather can take its toll on your fence. You’re much better off inspecting your fence for any signs of damage before summer starts. Your landscape elements help your home look beautiful. As much time as you spend landscaping this spring, don’t forget to examine how it all affects your fence. Start by taking a closer look at the trees on the edges of your property. Any weak branches might be hanging down and could be dropped onto your fences by the next gust of wind. To fix this, you’ll either have to detach the branches entirely or trim them so that they don’t present a problem anymore. Your bushes and shrubs might be thriving, but you don’t want to cover up your fences, either. You never know when termites or other pests, such as squirrels, might be hiding in there and hoarding their acorns. The next thing to try is to perform a stress test on your fences. Press down on each fence post and see if it gives or if it stays put. 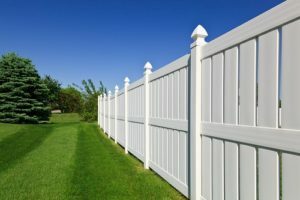 If you feel the post move underneath you, then this is a sign that you will need to repair or replace it so that your fence can remain standing. Spring sees tons of rainfall, and all of it can ruin your fencing if it is made of wood. High temperatures aren’t going to be kind to your fence, either. Whatever the weather is like in your area, be sure to check on your fence after every big storm and even on a nice day outside so you can spot any potential problems before they grow too big to ignore and too costly to fix. This entry was posted on Friday, May 18th, 2018 at 2:53 pm. Both comments and pings are currently closed.